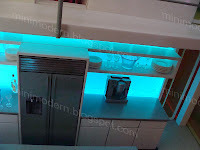 When I watch this backlit PRD kitchen cycle through an array of colors, I cannot help but think of the Emerald City scene from The Wiz. It's the scene where Richard Pryor (who plays the Wiz) makes announcements about what color is "IN" for Emerald City and then the citizens are immediately bedecked in that palette. Pryor's announcements are preceded by a sound of trumpets, etc. 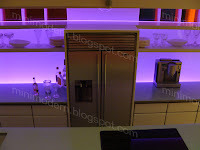 and so every time this kitchen changes color, I hear those horns playing in the background and it makes me chuckle. 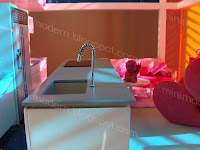 However, while I was setting up the miniature scenes above, I kept humming "Flashing Lights" by Kanye West and--since it has been getting a lot of airplay--singing the hook from "Day N Nite" by Kid Cudi. Okay, okay, I was also singing Wonder Pets. Anyone who owns the original Kaleidoscope House kitchen knows that the unit needs a bit of a design boost and some functionality. 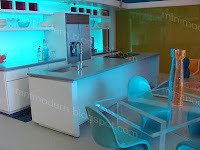 Per Paris Renfroe, the depth of the original KH kitchen unit would be so narrow in 1:1 scale that you would not be able to install a cooktop or a sink. I know exactly what he is talking about because I've set up scenes where a single miniature cooking pot covers all four burners of the KH kitchen stove. I know there are several of you out there nodding your heads. Anyway, it was time for a remodel. 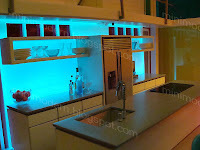 The kitchen is PRD Miniatures. Blue Views: The Panton chairs and the Swan chair are Reac Japan. The modular sofa and coffee and dining tables are ebay buys. The rug and one pillow are AG Minis. Fuchsia Views: The sofa is Voila Toys. The chair is Bozart Toys. The coffee table is Lundby. 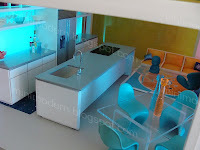 The rug and modular units are Battat. All other accessories are Re-Ment, Irwin, Mattel, Mighty World and Buddha Buddha Life. *Drool* What a fabulous kitchen from Paris! And yes, I have struggled with the kitchen set-up in the K House. My son said "Why doesn't anything open???" Love the set ups! 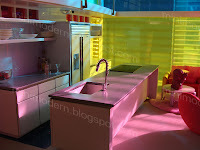 I like the different moods the changing colours brings to the scene, and the kitchen is just fabulous! I definitely hear you on the K House kitchen. This is a fantastic upgrade! 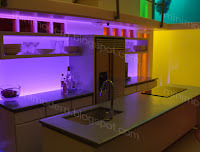 It would be nice to have the additional light source in the kitchen too. This kitchen. is. awesome. period. I spotted the pictures on Paris' site and shouldn't have been surprised to see them on your blog. Paris has MAD SKILLS! And by that I mean he is astute and proficient at designing and building. Ha ha!